Atmospheric Parisian cafés, quirky bookshops, and stylish students give the Latin Quarter a special Bohemian charm. This vibrant, artsy, and eclectic quarter is one of the oldest areas of Paris. During the Middle Ages, the Sorbonne University attracted scholars from all over Europe who learned and spoke Latin, explaining the quarter's name. There are still many higher education institutions in this historic academic quarter, including La Sorbonne and the Collège de France. Roughly bounded by Boulevard Saint-Michel, Boulevard Saint-Germain, and the Seine River, the Latin Quarter represents one section of the city's 5th arrondissement in the Left Bank. Most of the Latin Quarter is a medieval maze of winding, narrow streets and stone-paved alleyways, with a few quiet, hidden squares. Except for the Boulevard Saint-Michel, this quarter has a distinct old-world character. Wander off into the side streets to explore the pedestrian lanes. Peek into the ancient churches, dine aboard a boat docked on the Seine River, and discover the ruins of a Roman amphitheater. The Latin Quarter's lively feel, with its restaurants, shopping, cinema, and theaters, makes spending time here one of the most enjoyable things to do in Paris. Discover the beauty and depth of medieval art at the Cluny Museum. This National Museum of the Middle Ages is housed in the 14th-century Hôtel de Cluny, formerly the Paris town house for the Benedictine abbey of Cluny based in the Burgundy region. The building happens to lie on the excavation site of an ancient Roman bath complex. One of the museum's rooms is in the ruins of the former frigidarium (cold baths), which now displays Roman and Gallic sculptures of the 1st century AD. The Cluny Museum is most renowned for its collection of medieval tapestries. The oldest of the tapestries is the Flemish Offrande du Coeur, a delicate declaration of love created in the 15th century. The greatest treasure is the famous Lady with the Unicorn (Dame à la Licorne) tapestry series. Made in the 15th century, the six tapestries in the series were meant to be an allegory of the five senses and the joys of the senses. These exquisitely detailed tapestries were created in the "millefleurs" style of the time. This technique featured intricate patterns of flowers ("millefleurs" means "thousand flowers"), animals, and birds. Besides the unicorn, look out for the little bunny and friendly dogs. This famous landmark of the Latin Quarter is a mausoleum that holds the tombs of France's most prominent citizens. Above the facade of 18 Corinthian columns, an inscription reads "Aux Grands Hommes la Patrie Reconnaissante," which means "To Great Men, Their Country is Grateful." The celebrated architect Jacques-Germain Soufflot was commissioned by King Louis XV in 1756 to build a grandiose church replacing the ruined abbey of Sainte Geneviève. Soufflot succeeded at creating a masterpiece of Neoclassical style, with the architectural simplicity and monumentality of antiquity. After the church was completed, it was converted into a mausoleum by walling up the church windows to give the interior a somber ambience. The name Panthéon was inspired by classical temples of ancient Greece that were dedicated to multiple gods. The entire space of the Panthéon is devoted to remembering the accomplishments of France's most influential men. Underneath the main dome, Foucault's pendulum, that proved the rotation of the earth, was demonstrated here. There are 72 great citizens buried here. Among the famous names are the authors Victor Hugo and Emile Zola as well as the philosophers Voltaire and Rousseau. While wandering the Latin Quarter, take time to admire its historic churches, which are often missed by most tourists. The Eglise Saint-Séverin Saint-Nicolas is one of the finest examples of Flamboyant Gothic architecture in Paris. With its dark sanctuary illuminated by candles, the church has a somber and spiritual ambience. The architecture combines various styles, with a simple nave from the 13th-century and stained-glass windows dating from the 14th and 15th centuries. Other noteworthy details of the interior include the pillars with elaborately carved capitals and fanciful keystones. The Church of Saint-Séverin Saint-Nicolas regularly hosts classical organ recitals open to the public. Many visitors enjoy attending a concert here and find that listening to the holy music adds to the experience. The busy main thoroughfare of Boulevard Saint-Michel and the bustling Place Saint-Michel bring modern energy to the Latin Quarter. In contrast to the narrow medieval streets that are tightly packed in most of the quarter, the Boulevard Saint-Michel is a wide modern avenue designed by Haussmann in the 19th century. The Boulevard Saint-Michel is lined with artsy bookstores, clothing shops, busy cafés, and other student hangouts. 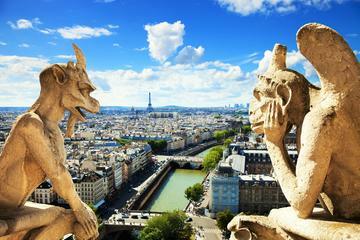 At the end of Boulevard Saint-Michel, a few steps away from the Seine River, is the Place Saint-Michel. This atmospheric public square is the real heart of the Latin Quarter. The square is crowded day and night with locals on the way to the Métro, students headed to class, and tourists traveling to visit Notre-Dame Cathedral. The centerpiece of the Place Saint-Michel is the monumental Fontaine Saint-Michel. Commissioned by Haussmann under Napoleon III, this stunning fountain depicts the archangel Michael vanquishing the Devil. The allegorical image evokes the theme of good battling evil. In the tourist tradition, stop to toss in a coin into the fountain and make a wish. An obligatory tourist experience is getting lost in the Latin Quarter's labyrinth of narrow medieval streets. The narrowest street is Rue du Chat Qui Pêche (The Cat Who Fishes), an alleyway that runs from Rue de la Huchette to the Seine River. This tiny street only provides enough space for pedestrians to walk single-file. 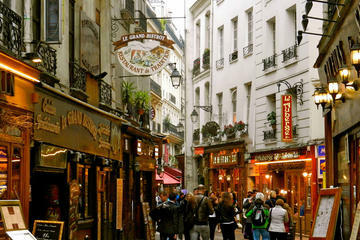 Rue de la Huchette is lined with small shops and with restaurants geared to tourists and students (but not gourmands). Other historic streets worth exploring include Rue Saint-Sevérin, where the Eglise Saint-Sevérin is located, and Rue de la Harpe, another street full of restaurants and cafés. On the gently sloping Montagne Sainte-Geneviève hill, the Rue Mouffetard is one of the oldest and most atmospheric streets in Paris. Known simply as "Mouffe," this narrow street is lined with historic shops, 16th to 18th-century houses, and quaint restaurants that are popular with students. (The upper part of the street is "Little Athens" with mostly Greek restaurants.) The street is especially lively on weekend evenings when many street musicians come out to entertain diners. Rue Mouffetard begins near the Panthéon and ends at the Place de la Contrescarpe, a pleasant square with many sidewalk cafés. To discover the quintessential Latin Quarter ambience, take a stroll down the Quai de la Tournelles, which runs along the Seine River. Les Bouquinistes are riverside book sellers along the quays around the Pont Marie (bridge). This popular open-air bookshop features separate stalls stocked with classic and modern literary works. In addition to used and new books, there are also postcards and posters for sale. Across the street from the book stalls at 53 Quai des Grands Augustins is Les Bouquinistes Restaurant. This contemporary restaurant features the gourmet cuisine of Guy Savoy. In an enchanting location near the Pont Neuf, the restaurant offers views of the Seine River and the books stalls set up along the quay. The Latin Quarter's ancient streets are also filled with many eclectic book stores including the legendary second hand bookshop Shakespeare and Company at 37 Rue de la Bûcherie. This Bohemian bookshop sells old editions of everything from Shakespeare to James Joyce. Shakespeare and Company is a well-known gathering place for writers, and some of the in-house writers even live here, sleeping on cots in between the library aisles. The shop hosts literary events such as book readings, children's hour, and book launches. The closest Métro station is Saint-Michel. For a truly memorable dining experience, try one of péniches along the banks of the Seine River around the Pont Saint-Michel. Péniches are charming little docked boats with inviting restaurants. These boat restaurants offer a unique tourist experience that's often missed by tourists. The restaurants have outdoor terraces offering magical views of the Seine River, Notre-Dame Cathedral, the Ile-Saint-Louis, and the Pont Neuf (bridge). Some péniches restaurants also feature live musical entertainment. To indulge in a more upscale meal, there is the legendary Tour d'Argent, one of Paris' most renowned gastronomic restaurants. This Michelin-starred restaurant is at 15 Quai de la Tournelle, along the Seine River waterfront. The dining room dazzles guests with its spectacular views of the Notre-Dame Cathedral. The refined (and expensive) restaurant is famous for its classic French cuisine. One of the restaurant's legendary desserts is called "Les Crêpes Belle Epoque" (crêpes served in an orange sauce). Be sure to make a reservation in advance and wear appropriate attire. The closest métro stations are Saint-Michel or Maubert - Mutualité station. Another exquisite historic church, the Eglise Saint-Etienne-du-Mont was built in the 15th century from the Late Gothic period to the Renaissance. The architecture shows the evolution of styles. The nave of the church features stellar Gothic vaulting, while the round pillars were influenced by Renaissance design. The church is famed for its rood-screen, which has a central marble section and a spiral staircase at each end. At the entrance to Our Lady Chapel are the epitaphs of the philosopher Blaise Pascal and the dramatist Jean Racine, who are buried in the church. The church is also said to contain a stone from the tomb of Saint Genevieve. Spectacular 15th to 16th-century stained-glass windows depict scenes of the Apocalypse and the Parable of the Marriage Feast. The Place de l'Odeon is an elegant square lined by lovely old Parisian buildings. The most important monument on the square is the impressive Théâtre de l'Odéon. This theater is the home of the Comédie-Française, a theater company that performs classic French theater such as comedies by Molière and drama by Victor Hugo. On warm days, students like to linger on the arcaded patio and steps of the theater. The charming side streets around the Place de l'Odeon are delightful to explore. Take a stroll and discover the trendy boutiques and happening restaurants. For a change of scenery just a few steps away, the tranquil Jardins du Luxembourg are a perfect place to relax and enjoy a picnic lunch in the setting of a formal French garden. The closest Métro station is Odéon. On the Quai Saint-Michel beyond Square Viviani, the Eglise Saint-Julien-le-Pauvre is an interesting historic church. It was built in High Gothic style between the mid-12th and mid-13th century. In the 15th and 16th centuries, the Rector of the University was elected in this church, and its bell was rung to announce the beginning of lectures. The interior of Saint-Julien-le-Pauvre Church is dominated by an icon-decorated screen installed in 1901. There is a lovely perspective of the church's silhouette from a spot on Rue Galande near the Eglise Saint-Sevérin. Known as "La Sorbonne," this ancient academic institution was founded in 1253 as a college for poor students of theology who could live and study at the school's expense. The college soon developed into a leading school of theology and became a university. During the reign of Napoleon, the Sorbonne was considerably enlarged and was given the status of a State university. The present buildings were constructed between 1885 and 1901 with 22 large lecture halls and hundreds of classrooms. The main front of the Sorbonne on Rue des Ecoles is decorated with allegorical representations of the sciences. The main lecture hall, the Grand Amphithéâtre, has seating for 2,700, and the auditorium features the celebrated mural by the Neoclassical painter Puvis de Chavannes, The Sacred Grove. In the courtyard of the Sorbonne is a Baroque chapel built between 1635 and 1684. A legacy of the Royal Garden of medicinal plants kept by King Louis XIII in the 17th century, this lush green space is a tranquil spot to relax and escape to nature, right in the heart of Paris. The Jardins des Plantes includes a Botanical Garden with an exceptional variety of flowers and plants. The gardens have a special focus on biodiversity and support ecology programs. Inside the gardens is the Musée National d'Histoire Naturelle, which offers a comprehensive view of the various fields of natural history including botany (the collection features more than 10,000 plant species), mineralogy (with notable giant crystals), zoology, ecology, and paleontology. The museum is also a place of study for students from the nearby University of Paris. The Lutetia Arena is the remains of an ancient Roman amphitheater of Paris, discovered in 1869. These ruins give an idea of the huge size of the original amphitheater, once used to stage gladiator and animal fights. The elliptical arena was 56 meters long by 48 meters across, roughly the same size as the interior of the Colosseum in Rome. The amphitheater was built in the Roman city of Lutetia (site of today's Paris city center) around AD 200, but later in the same century, during a barbarian incursion in 285, it was used as a quarry of stone for building defensive walls. Although the amphitheater had only 36 tiers of seating, it could accommodate an audience of 17,000, which was almost the entire population of the city during antiquity. Discover an oasis of Islamic culture right in the Latin Quarter, just a few steps away from the Museum of Natural History. A relatively recent addition to the neighborhood, the Grand Mosque of Paris was built between 1922 and 1926. The mosque is frequented by the local Muslim community but also offers tourists a unique and exotic experience. The interior of the Grand Mosque is a stunning masterpiece of Hispano-Moorish style. The prayer hall features magnificent carpets, and the hammam replicates the baths of North Africa with colorful mosaic tile decorations. Featuring delicately adorned archways, the patio was inspired by the Alhambra Palace in Granada. Amble through the lush fountain-adorned gardens and enjoy fresh mint tea at the salon de thé (tea salon) in the patio, or savor a delicious meal of authentic couscous at the Mosque's restaurant. It is also possible to visit the traditional hot and cold baths and relax in the sauna. Check the schedule; certain days are reserved for men, others for women. For those who want to learn more about the architecture, guided visits are available. The tea salon and restaurant entrance is at a different location from the mosque, on a parallel street. This excellent small museum lies on the border of the Latin Quarter and the Saint-Germain-des-Prés neighborhood. The museum celebrates the life and work of French Romantic painter, Eugène Delacroix. The collection spans Delacroix's career, giving visitors an in-depth sense of the artist. The museum's exhibitions show the different themes that Delacroix depicted as well as his artistic influences. For instance, the museum displays Moroccan objects of art from his trip to Morocco in 1832. Highlights of the collection include the Magdalene in the Desert painting exhibited at the 1845 Salon and another religious composition called the Education of the Virgin, painted in 1842. The museum also boasts the artist's only three attempts at fresco art, created in 1834. Many of the other famous works by Delacroix are found in the Musée du Louvre across the Seine River in the 1st arrondissement. Luxury Hotels: Between Boulevard Saint-Germain and the river, just opposite the Louvre and a 10-minute walk to the Musee d'Orsay, Hotel Da Vinci features a spa, soaking pool, beautifully appointed rooms, and superb service. Off Boulevard Saint-Germain at l'Odeon, the boutique Hotel Relais Saint-Germain includes breakfast and preferential table bookings for dinner at Le Comptoir. Spacious rooms at Relais Christine, on a quiet street between Boulevard Saint-Germain and IÎle de la Cité, overlook a flower-filled courtyard and include free parking. Mid-Range Hotels: Just off Boulevard Saint-Germain, near Musee d'Orsay, family-run Hotel Pas de Calais has a glass-covered courtyard of flowers, free Wi-Fi, and individually decorated rooms. At the other end of Boulevard Saint-Germain, boutique Odeon Hotel has soundproof windows and is a five-minute walk from the Metro and Luxembourg Gardens. The elegant and independently-owned Left Bank Saint Germain is just off Boulevard Saint-Germain. Budget Hotels: Only a block from the Cluny Museum, some rooms at Hotel du College de France have good-sized balconies with chairs and tables. Almost next door, on a quiet street, Hotel Marignan includes free breakfast and laundry facilities. Art Deco touches highlight some of the rooms at Grand Hotel des Balcons, between Boulevard Saint-Germain and Luxembourg Gardens; some are large enough for families. Tours of the Latin Quarter: Join an expert guide on a Paris Latin Quarter Night Walking Tour for a two-hour insider exploration of the neighborhood's landmarks, history, architecture, characters, and lore. This guided evening stroll will take you from medieval Paris to the haunts of Picasso, the beat poets, and Jim Morrison. Join the Café Lifestyle: Whether you sip your coffee at a tiny street side table on rue du Buci or in the famed Les Deux Magots, where Hemingway once wrote, you can't miss this almost mandatory Paris experience.